One simple filter does it all. The WaterBasics Series II GRN Line filter is certified to EPA and NSF/ANSI standards and makes a great filter for questionable tap water or water collected from the out-of-doors. Series II design gives it maximum connectivity and function in emergencies and beyond. One simple filter does it all. The WaterBasics Series II GRN Line filter is certified to EPA and NSF/ANSI standards to remove bacteria, Cryptosporidium, Giardia, chlorine, chemicals, taste, and odor for up to 80 gallons. The Series II GRN Line filter is an all-in-one water filtration solution. It includes everything you need to filter water in a compact and easy to use package. Use the resealable pouch as a cup to collect or store water. Drink through the filter with included mouthpiece, right from the pouch. 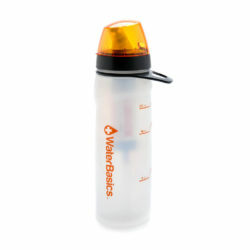 The Series II filter design allows it to integrate with any WaterBasics bottle, kit or system with ease and simplicity. 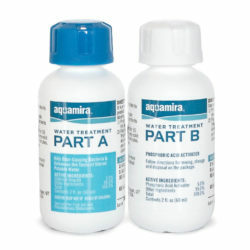 WaterBasics GRN Line protection is achieved using Electro-Positive Absorption Technology. Charged micro-glass fibers “pull” organisms as small as bacteria, out of the water stream while still maintaining high flow rates and low pressure drops making WaterBasics Series II GRN-Line Emergency Filters the perfect choice for water bottle, pump and gravity flow applications. WaterBasics GRN Line filters have been thoroughly tested by independent laboratories, and proven to consistently remove bacteria and protozoan cysts to ANSI/NSF Standard 53, and US EPA standards, without the use of disinfecting chemicals such as chlorine, bromine, or iodine. The addition of sub-micron carbon particles into the filter media increases the absorptive capability required to reduce chlorine and harmful chemicals, bad tastes and odors. 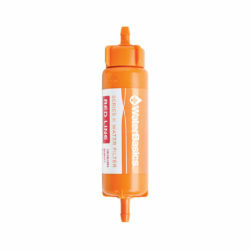 WaterBasics GRN Line Emergency Filters provide superior biological protection, high flows and long service life in a compact, lightweight, and easy to use capsule.